The feast of St. Mark was not regularly inserted into the Roman Calendar until about the Twelfth Century. This is explained by the original association of the commemorations of the saints with their tombs. 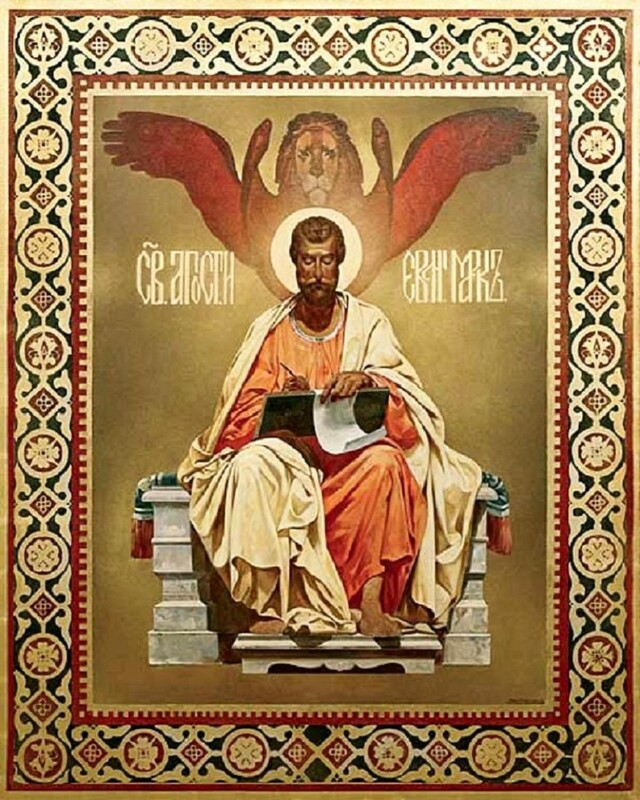 Although St. Mark was among the first who with St. Peter brought the Faith to Rome and at the request of the Romans themselves, wrote his Gospel, he did not die in the Holy City. St. Peter sent him to Alexandria in Egypt, and he was first bishop of that city. He governed his See for about twenty years and in the end was martyred, A.D. 70, by the heathen. His symbol is a lion, for his Gospel begins with the mission of John the Baptist in the desert and the voice of the lion resounds in desert places. Mark is said to have been the young man who, on the night that Jesus was made prisoner, left the sheet in which he was clothed, in the hands of the soldiers and fled naked. He accompanied his cousin, Barnabas and Paul, on their first apostolic mission. Paul, however, would not take him along on the second journey; when Paul was in prison at Rome, Mark was again closely associated with him. His body was taken to Venice whose patron he has been since the Ninth Century. 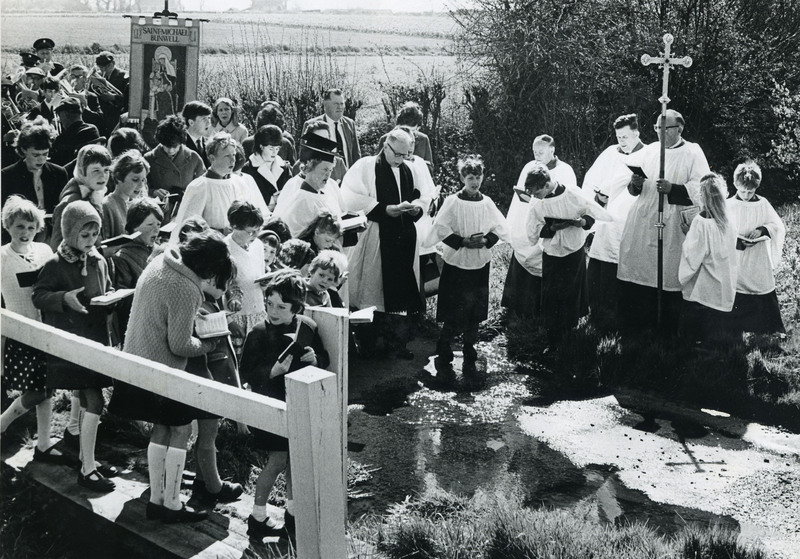 “Rogation” comes from the Latin “rogare,” which means “to ask,” and “Rogation Days” are days during which we seek to ask God’s mercy, appease His anger, avert His chastisements manifest through natural disasters, and ask for His blessings, particularly with regard to farming, gardening, and other agricultural pursuits. They are set aside to remind us how radically dependent we are on Mother Earth, and how prayer can help protect us from nature’s often cruel ways. The four days are April 25, which is called the Major Rogation; and the three days preceding Ascension Thursday, which are called the Minor Rogations. Traditionally, on these days, the congregation marches the boundaries of the parish, blessing every tree and stone, while chanting or reciting a Litany of Mercy, usually a Litany of the Saints (bottom of this page). Collecta at the Title of Lucina. Station at St. Peter The Litanies and the Mass of Rogation for this day are of ancient origin, except the Introit, which in early days was replaced by the Litany in processions. The feast of St. Mark is of much later origin. The pagan festival, Robigalia, occurred on April 25th; young people used to go across the Milvian bridge to sacrifice to Robigus who preserved grain from blight. The Christian procession formed at St. Lawrence in Lucina and went by the Flaminian Way over the same bridge, where the sign In hoc singo vinces appeared to Constantine. Then going along the Tiber, passing in back of Castel Sant Angelo entered St. Peter’s. The people were thus taught that it was not the favor of the heathen god, but a devout life, humble prayer, and the intercession of the saints, especially that of St. Peter, the Pastor ovium, which would disarm the justice of God offended by our sins. This rite is called the Greater Litanies, because it was of a much more solemn nature than the ordinary stational litanies. The procession is a survival of classical tradition incorporated into religious customs; the Church preferred to give a spiritual significance to observances implanted in the hearts of the people, rather than suppress them partially. The Litany still preserves the very ancient type of prayer which ended the night vigil and served as a transition between the vigil office and the offering of the Holy Sacrifice. The oldest part of the Litany is that which begins with the words “Through the mystery of thy holy incarnation” which belongs to primitive Christianity. O God, Who didst endow blessed Mark, Thine evangelist, with the grace of preaching, grant us, we beseech Thee, ever to profit by his teaching and be defended by his prayers. Through Jesus Christ our Lord, Who liveth and reigneth with Thee in the unity of the Holy Ghost, one God Forever and ever. R.Amen. Grant, we beseech thee, O Almighty God, that we who in our tribulation are yet of good cheer because of thy loving-kindness, may find thee mighty to save from all dangers. O God, Who dost gladden us by the merits and inter-cession of blessed George, Thy Martyr, mercifully grant that we, who ask Thy favors through him, may obtain them by the gift of Thy grace. Through Jesus Christ our Lord, Who liveth and reigneth with Thee in the unity of the Holy Ghost, one God Forever and ever. R.Amen. Lesson from Ezechiel the Prophet. As for the likeness of the faces of the four living creatures; there was the face of a man, and the face of a lion on the right side of all the four; and the face of an ox on the left side of all the four; and the face of an eagle over all the four. And their faces and their wings were stretched upward; two wings of every one were joined, and two covered their bodies; and every one of them went straight forward; whither the impulse of the spirit was to go, thither they went, and they turned not when they went. And as for the likeness of the living creatures, their appearance was like that of burning coals of fire, and like the appearance of lamps. This was the vision running to and fro in the midst of the living creatures, a bright fire, and lightning going forth from the fire. And the living creatures ran and returned like flashes of lightning. In that time: the Lord appointed also other seventy-two: and he sent them two and two before his face into every city and place whither he himself was to come. And he said to them: The harvest indeed is great, but the labourers are few. Pray ye therefore the Lord of the harvest, that he send labourers into his harvest. Go: Behold I send you as lambs among wolves. Carry neither purse, nor scrip, nor shoes; and salute no man by the way. Into whatsoever house you enter, first say: Peace be to this house. And if the son of peace be there, your peace shall rest upon him; but if not, it shall return to you. And in the same house, remain, eating and drinking such things as they have: for the labourer is worthy of his hire. Remove not from house to house. And into what city soever you enter, and they receive you, eat such things as are set before you. And heal the sick that are therein, and say to them: The kingdom of God is come nigh unto you. Bringing Thee gifts, O Lord. on the festival of blessed Mark, Thine evangelist, we pray Thee, that, as the preaching of the Gospel made him glorious, so his intercession may render us in word and deed acceptable to Thee. Through our Lord Jesus Christ Thy Son our Lord, Who liveth and reigneth with Thee in the unity of the Holy Ghost, one God Forever and ever. R. Amen. We beseech thee, O Lord that these offerings may both loosen the bonds of our wickedness, and obrain for us the gifts of mercy. Sanctify the gifts we offer Thee, O Lord, and through the intercession of blessed George, Thy martyr, cleanse us by them from the stains of our sins. Through our Lord Jesus Christ Thy Son our Lord, Who liveth and reigneth with Thee in the unity of the Holy Ghost, one God Forever and ever. R. Amen. May Thy holy things, we beseech Thee, O Lord, bring us continual protection, so that, through the prayers of blessed Mark, Thine evangelist, they may ever guard us from all evils. Through Our Lord Jesus Christ, Thy Son, Who liveth and reigneth with Thee in the unity of the Holy Ghost, one God For ever and ever. R. Amen. Mercifully grant our prayers, we beseech thee, O Lord, that while we receive thy gifts in tribulation, we may be conforted, and so increase in thy love. Through Jesus Christ, thy Son our Lord, Who liveth and reigneth with thee, in the unity of the Holy Ghost, ever one God, world without end. R. Amen. We beseech Thee, O almighty God, that those whom Thou dost refresh with Thy sacrament, Thou also grant them, by the intercession of blessed George, Thy martyr, to serve Thee, as befits them, with behavior pleasing unto Thee. Through Our Lord Jesus Christ, Thy Son, Who liveth and reigneth with Thee in the unity of the Holy Ghost, one God For ever and ever. R. Amen. St. Michæl, Pray for us. St. Raphæl, Pray for us. St. John Baptist, Pray for us. St. Stephen, Pray for us. St. Lawrence, Pray for us. St. Vincent, Pray for us. All ye holy martyrs,Pray for us. St. Gregory, Pray for us. St. Anthony, Pray for us. St. Dominic, Pray for us. St. Francis, Pray for us. St. Mary Magdalen, Pray for us. St. Cecilia, Pray for us. St. Anastasia, Pray for us. All ye holy men and women, saints of God, Intercede for us. Be merciful to us, Pray for us. Through the coming of the Holy Ghost the Comforter, O Lord, deliver us. In the day of judgment, O Lord, deliver us. That Thou spare us, We beseech Thee, hear us. That Thou vouchsafe to rule and preserve Thy holy Church, We beseech Thee, hear us. That Thou vouchsafe to preserve our apostolic prelate and all ecclesiastical orders in holy religion. We beseech Thee, hear us. That Thou vouchsafe to humble the enemies of Thy holy Church, That Thou vouchsafe to grant peace and true concord to Christian kings and princes, We beseech Thee, hear us. That Thou vouchsafe to confirm and preserve us in Thy holy service. We beseech Thee, hear us. That Thou render eternal good things to all our benefactors, We beseech Thee, hear us. That Thou vouchsafe to give and preserve the fruits of the earth, That Thou vouchsafe to give eternal rest to all the faithful departed. We beseech Thee, hear us. That Thou vouchsafe graciously to hear us. We beseech Thee, hear us.